Iridium satellite communicators are shrinking, and Garmin’s latest—the InReach Mini—makes a compelling case for keeping one of these handy little units in your flight bag. 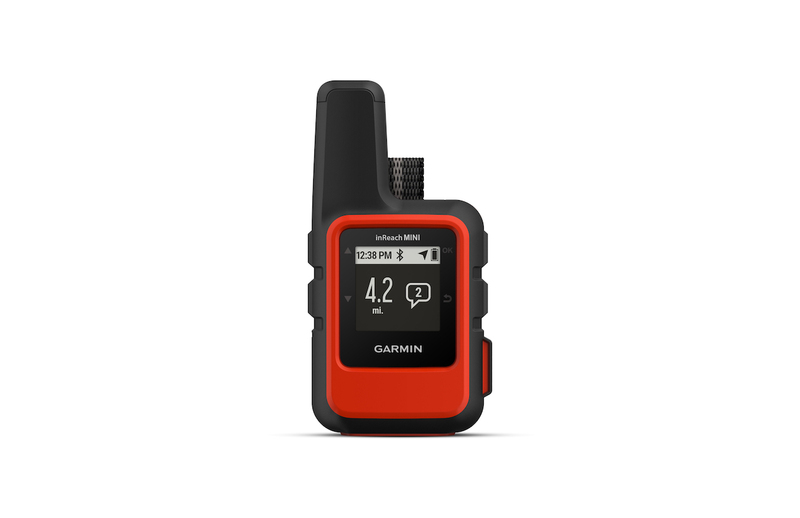 Garmin bought GPS navigation and satellite communication company DeLorme in 2016, and this is the first new device developed under Garmin’s ownership. The advantage offered by Iridium is its worldwide reach, with coverage available anywhere due to the high numbers of satellites in low-earth orbit. The Mini is tiny, weighing just 100 grams, and easily fits in a shirt pocket. It is so small that it’s a good idea to attach the included carabiner to the back and then attach the carabiner to a backpack or a buttonhole to keep it from disappearing. Garmin sells accessories for the Mini such as a belt holder, lanyards, and more. With an IPX7 water rating (immersion less than one meter for less than 30 minutes), the Mini’s built-in lithium-ion battery lasts for up to 20 days in extended tracking send mode (30-minute intervals). At the default 20-minute tracking send mode, the battery should last for up to 50 hours, or 30 hours in 10-minute tracking with one-second log intervals. While the included documentation doesn’t specify any speed limitations, it seems to work better at slower speeds. I’ve been able to get the Mini to work while sitting in an airline window seat, but it isn’t always able to lock cleanly on to an Iridium satellite in those circumstances. It also works well in the cabin of business jets. When positioned on the ground with a clear view of the sky, sending and receiving text messages with the Mini is reliably swift. The Mini has its own GPS receiver and this drives the map and tracking features. While it can be used standalone (without an associated smartphone app), texting is somewhat challenging using the Mini’s up and down arrow and OK keys to select letters of the alphabet. The user can also create canned preset messages that are easy to select and send from the Mini. The easier way to use the messaging and other features is to download Garmin’s Earthmate app onto an iPhone or Android device. The app also features detailed topographic maps and color aerial imagery that can be downloaded for offline use. An option for the inReach communicators is weather forecasts, delivered either to the device or the Earthmate app. The Mini is also compatible with the Garmin Pilot app and other Garmin devices such as aviation and outdoor watches. Once connected to Garmin Pilot, it can be used to create, send, and receive inReach messages. Another handy feature of carrying the Mini is that it can act as the GPS source for Garmin Pilot running on a device without its own GPS receiver. I tested this feature too, and it provided a solid GPS signal for my iPad. Probably the Mini’s best feature is the SOS button. Lift the rubber cover, push the button, and help is on the way from the GEOS 24/7 emergency response team. Garmin has documented several saves thanks to inReach devices. The inReach devices also work with Leidos Flight Service’s Surveillance Enhanced Search and Rescue (SE-SAR) service, which monitors position reports sent by the device. SE-SAR works in the continental U.S., Hawaii, Puerto Rico, U.S. Virgin Islands, and Guam. For aircraft that are too small to install a sophisticated air-to-ground connectivity system or when that option is too expensive, the inReach Mini satisfies the need for text-style communications plus added features like tracking and emergency rescue assistance. Its portability makes it ideal for pilots who fly many different aircraft types. The Mini retails for $349. Personal service plans include the lowest rate Safety plan at $11.95 per month for an annual contract (or $14.95 without contract), and this comes with 10 text messages (limited to 160 characters) per month, tracking points and location pings at 10 cents each, 10-minute tracking points, and one basic weather text. The top Extreme plan costs $79.95 per month for the annual plan or $99.95 per month without an annual contract. Included are unlimited text messaging, tracking points, location pings, and basic weather, and 2-minute tracking points. All plans (there are four) include unlimited preset messages and unlimited SOS usage. Also included is free access to Garmin’s Explore website for trip planning, preset message creation and text messaging, managing device settings, firmware updates, links to social media accounts, tracking data storage and other features. I'm a private pilot and I've been using the inreach for a few years in Cessna as pilot and Airbus as pax. It's an awesome device. With regards to spotty reception in aircraft: you need to have direct line of sight to a satellite for communication to work. Depending on latitude, you might have 1 (equator) to 9 (poles) satellites visible. In aircraft (or on the ground with obstacles), I suggest using an app such as iridiumwhere.com to find satellite locations and adjust device accordingly.